Blue + White Club gifts help us to recruit, retain, train, and support outstanding student-athletes through scholarships, facilities, travel, and other services. 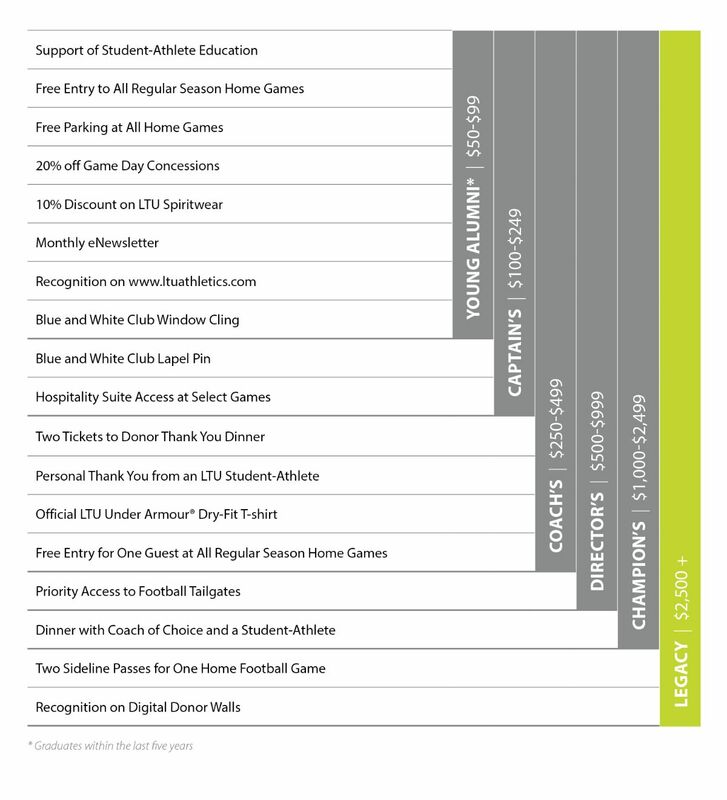 Learn more about the history and priorities of LTU Athletics. **When available. Subject to change. Your unrestricted gift to the Blue Devil Athletics Fund provides resources to participants in all sports and allows the Department of Student Recreation, Athletics, and Wellness to respond to changing needs and unexpected opportunities. Or, you may designate all or part of your gift to a specific sport or sports, serving student-athletes on the teams that are most important to you. All gifts are tax deductible to the extent allowed by IRS law. If your donation level entitles you to an item of clothing, a member of the LTU Advancement staff will contact you for your size.